A Count Dooku Lightsaber to complete your Count Dooku costume! 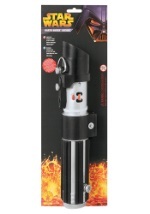 It is made of durable plastic and has control buttons that imitate light sabers from the movies. (Buttons are only for appearance). A red plastic extension can be pulled from the inside of the handle to give the light saber a total length of over 2.5 feet. The blade lights up red when the power button is pressed (needs two AA batteries which are not included). 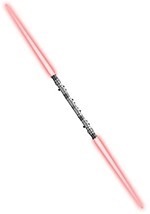 Get this Count Dooku lightsaber to fight for Sith revenge!